A person doesn’t have to have ever written a poem to be a poet, you already know that though, I’m guessing. So the poets that shaped me have not necessarily shaped me by virtue of their having written poems. Watching my mother drag two kids and a pram and shopping bags up the stairs to the top floor of a tenement block with no elevator every single day of my childhood taught me all I need to know about poetry. South London asphalt taught me all I need to know about poetry. Addiction taught me all I know about poetry. Panic disorders, amphetamine psychosis and spectral voices at 4:48am taught me all I need to know about poetry. London and Cordoba banging their frantic morse-drums in my chest day and night taught me all I know about poetry. The crack-pipe in my mouth at fourteen years old taught me all I need to know about poetry. In South London, language, and the commandeering of oral communication, was power. As working-class kids knocking about on council estates all you have is your tongue, your larynx, your gnarled alphabet. Spiel is an act of survival. Every kid I knew growing up was a poet by another name. We splayed the alphabet daily. That’s where I learnt everything I need to know about rhythm and emphasis and repetition and refrain and the silences and crawl-spaces between tenses that hold a lit match up to life and death. 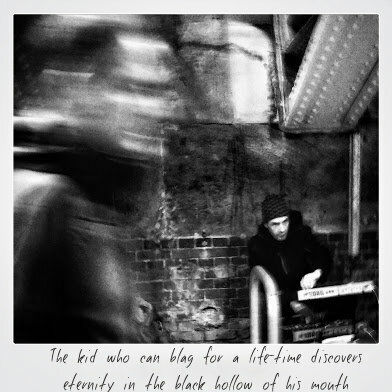 The kid who can blag for a life-time discovers eternity inside the black hollow of his mouth. I’ve seen people murdered by glottal stops. Verbal wounds you’ll spend a lifetime removing guttural-shrapnel from. The bruised air of a girl holding her breath for infinity. The beauty and fragility of a self-worth erected upon nothing more than the lightning dynamo of a street-kid’s hyperbole and rhetoric and bravado taught me every single thing I need to know about poetry. And, by the way, I was that kid…. Miggy’s poetry collection Grime Kerbstone Psalms is available digitally here. Paperback copies are a little rare, best to contact Celandor for options. Miggy organises and comperes Nottingham’s monthly poetry event Speech Therapy and facilitates writer’s workshops.